Rarely does a starfighter receive sunch deserving parise as the original Warhawk starfighter. It's creators should be legends in the field of modern starfighter design. Unfortunately all but one of the 30 person development group are currently dead or missing presumed dead. that one designer is Vera Emidyon. Systems coordinator of the Warhawk project, Vera oversaw the entire developmental process from concept designs right through to final production. However she never shared in the enduring sucess of the Warhawk project except from afar. As the project moved into the testing phase Vera became aware of several conflicting personalities in the system, most notably Enjin Doss and her brother Mavek Kimball. Doss is widely know as the sole creator of the Warhawk and indeed is listed as such on the contract with the Governing Board of Demeter IV. Doss, through treachery and deceit took command of the Warhawk project in order to realize the profits he knew would follow. Only the people who got out of his way lived to see his triumph. Vera, trying to protect her sister in-laws life and indeed her own emigrated to Demeter VI. Faking her death was the first part of the plan. Getting revenge, the second part, never panned out. On Demeter VI Vera fell in love with a farmer named Bazek Edimyon whom she married. Unfortunately her sister in-law died of a strange virus several years after giving birth to Dwayne Kimball. Vera and Bazek raised Dwayne as thier own son and all was peacefull for many years. Enjin Doss undoubtedly would have hunted her down had he know she was alive. Fortunately Doss was poisened by one of his concubines. His vast fortune defaulted to the government of Demeter IV after a long and pathetic trial. 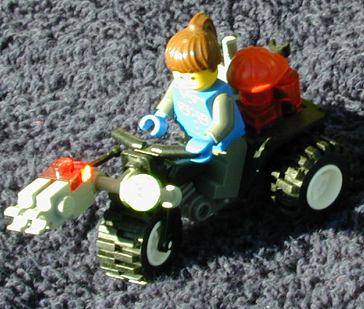 Vera, happy as a farm wife, was forced to recall her engineering expertise as bandits bean atatcking Demeter VI. Overseeing the re-fit of some 70 old starfighters, Vera enabled Demeter VI to fight back. Her "son" Dwayne turned out to be a valuable asset as well having inherited his fathers piloting skills. Vera now runs a small starship conversion facility on weekends where her and her tech crew "optimize" a wide range of starcraft. Nearly all OddJobbers craft have been processed by her wizard technicians and all have greatly benefited from her touch. Most noteworthy is the "revision" Vera engineered for the Warhawk II. Displeased at the predecessor to her original design, Vera took a severely damaged Warhawk II (provided by OddJobbers) and created the Warhawk IIz. A truly superior craft to the throngs of regular II's in space today the IIz was such a sucess a second was comissioned and an exclusivity contract was signed. If you want the most out of your starcraft, take it to Vera's! "Veras Garage is the best place to customize your spacecraft - if you can afford it." "No organisation has benefitted from it's association with Veras Garage more than OddJobbers has.And rightfully so, there wouldn't be a Veras Garage without Oddjobbers.